Dubai, United Arab Emirates: The ninth edition of the MENA Effie Awards (Effies) is set to take place on November 15, 2017. 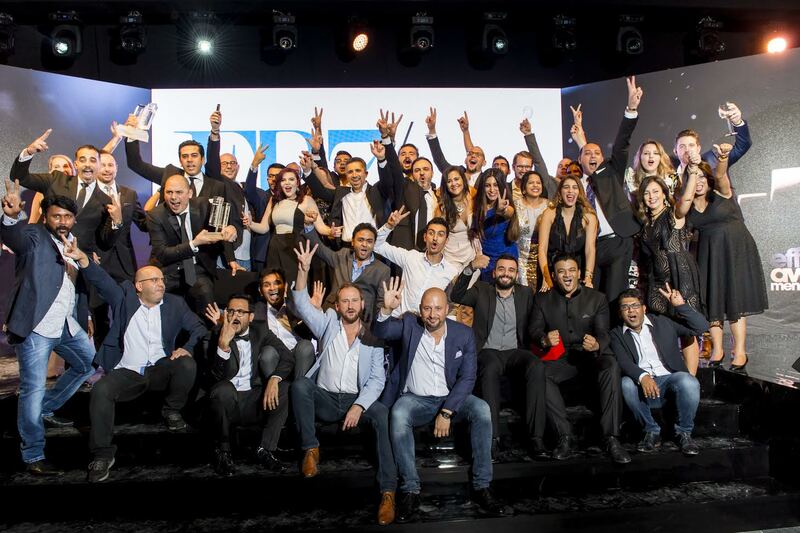 The awards programme was launched to honour the most effective marketing efforts in the region and the ceremony is expected to attract more than 2,000 attendees, including the best marketing and advertising minds in the Middle East. The call for entries is now open across 29 categories, including a new addition for this year – ‘Renaissance’. The first entry deadline is on Thursday, September 7, with the second following on Thursday, September 14, and the final deadline on Thursday, September 28. All entries must be made before 6pm Dubai time on the specified dates. The programme boasts a wide range of industry-specific categories, including ‘Automotive’, ‘Banking, Finance & Insurance’, ‘Cosmetics & Fragrances’, ‘Electronics’, ‘Food & Beverage – FMCG’, ‘Non-Food FMCG’, ‘Healthcare Services’, ‘Personal Care Products’, ‘Retail & Luxury’, ‘Entertainment & Sports’, ‘Telecommunications, Mobiles & Internet’, and ‘Travel, Tourism & Transportation’. Entrants are encouraged to showcase their marketing and branding innovation in categories such as ‘New Products & Services’, ‘Media Idea’, ‘Brand Experience’, ‘Branded Content’, ‘Media Partnership Activation’ and ‘Seasonal Marketing’. The programme also includes a dedicated ‘Shopper Marketing’ category, two ‘Youth Marketing’ categories – one for children and one for teenagers and adults – and two ‘Social Good’ categories for corporate brands and non-profit organisations. Alongside the Effie Awards ceremonies taking place across the world is the Effie Effectiveness Index, the most comprehensive global ranking of marketing effectiveness. It identifies and ranks the world’s most effective agencies, marketers and brands by analysing finalist and winner data from 40+ worldwide Effie Award competitions. The 2017 Effie Effectiveness Index has just been released and is compiled from 3,601 finalists and winning entries from worldwide 2016 Effie Award competitions, with winners including Unilever for ‘Most Effective Marketer’ and Vodafone for ‘Most Effective Brand’. The winners of the MENA Effie Awards 2017 will become part of the ranking process for the 2018 Effie Effectiveness Index. The MENA Effie Awards aims to establish a gold standard of creative marketing brilliance in the region and is being generously supported this year by Choueiri, Main Sponsor; DMC, Strategic Sponsor; ATL and IPSOS, Category Sponsors; Cicero & Bernay Public Relations, Official PR Partner; and Communicate, Gulf Marketing Review and The Media Network, Media Partners. Mediaquest is one of the region’s largest, most successful and most influential privately owned media companies. Established in 1997, Mediaquest’s mission is to inform, educate and entertain audiences across the MENA region, thereby building bridges between the Arab world and the West. Mediaquest generates a combined online and offline portfolio of more than 20 titles, covering marketing, communications, women’s interests, lifestyle, entertainment and automotive. Reputed brands include: Marie Claire Arabia, Haya magazine and Buro 24/7 Middle East, as well as the highly regarded business-to-business media: TRENDS, Saneou Al Hadath, AMEinfo, Arabies, Gulf Marketing Review and Communicate. Mediaquest’s dedicated dotmena network hosts 75 premium websites that attract more than 41 million unique visitors each month. Mediaquest creates, project manages and delivers some of the region’s best-known industry events, including arab luxury world, the conference on the business of luxury; the Top CEO Conference and Awards; the Festival of Media MENA Conference and Awards; the Marketing to Women Conference; and the prestigious annual MENA Effie Awards, which are recognised as a benchmark for achievement in the region’s marketing sphere.